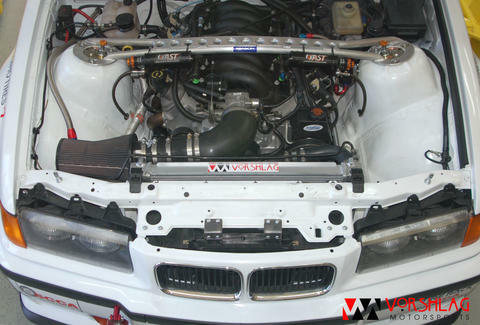 Because putting a V8 in a Bimmer's as complicated as it is utterly awesome, Vorshlag Motorsports's E36 LS1 kit takes all the guessing and fabrication work out of the engine-swap equation, taking Chevy's powerful LSx line of motors (Corvette/Camaro) and merging it with an E36 BMW ('92-98 3-series) -- a classic chassis that, much like Betty White and the wine you must drink to sleep with Betty White, keeps getting better with age. It results in a much faster car. 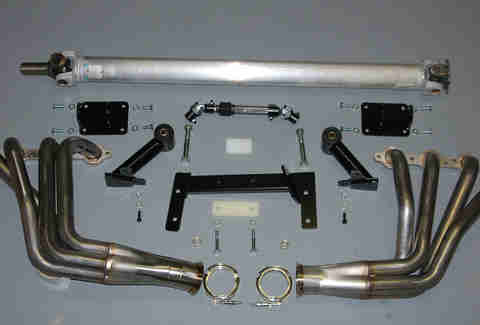 To make the swap as easy as possible, the kit includes tons of custom bits they've built in-house, like transmission mounts, perfectly-fitting long-tube headers, a correct-length driveshaft, motor mounts that'll help that V8 fit nicely under the hood, and a steering shaft that's designed to not interfere with all those other bits. Or, if you don't have a favorite shop/can't do it yourself, give 'em a call and they'll be happy to do it all for you -- just provide the chassis and motor, then drive off into the utterly awesome sunset.